Enjoy the comfortable fit of our popular R.J. Toomey Summer Comfort Jak Shirt. This short-sleeve black clergy shirt can be worn loose for a more casual look. Our Toomey Jak shirt with two collar inserts is styled with a low collar and adjustable waistband. 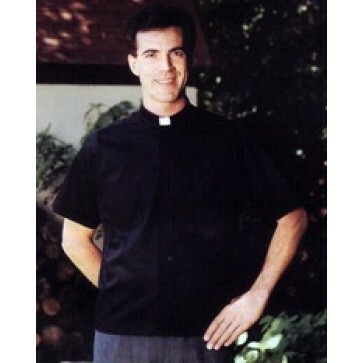 This jak blouse is available in neck sizes 14 to 20 from our traditional and contemporary collections of distinctive clergy wear for men and women at MatthewFSheehan.com.